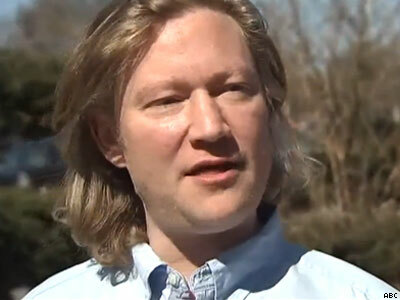 After a verbal altercation with North Carolina's Republican governor that cost him his job, Drew Swope received some needed support from the Charlotte's Democratic mayor. A gay grocery store clerk who lost his job after making a snide comment to governor of North Carolina when the Republican leader came into his store is getting some help from the mayor of Charlotte, reports Talking Points Memo. Drew Swope told TPM that he was fired from his job at Reid's Fine Foods in Charlotte after a confrontation Sunday with Gov. Pat McCrory when the governor stopped by the store. Swope contends he simply told the governor, "Thanks for nothing," then walked away, which prompted the Republican politician to begin screaming at Swope. "When he started yelling at me, it was a sudden turn because I made sort of a swishy move," Swope told TPM in an interview Tuesday. A spokesperson for the governor claimed that move was actually an obscene gesture, which Swope denies. "I’ve been discriminated against a lot, and I can see that moment when someone just suddenly goes ballistic because of this other thing, not what you said or did. … I don’t know what he was thinking, but I’ll tell you from man to man: He was hating on me for being a fag." Later that day, Swope was fired. He said he doesn't have any hard feelings toward his employer and understands why he was terminated. But Tuesday, Swope told TPM that Charlotte's Democratic mayor, Pat Cannon, asked Swope to send the mayor his résumé, in hopes of connecting the clerk with a new job. "To lose a job is nothing that someone wants to do," Cannon told TPM. "I felt that I would do what I could to help him along the way, if I could make something happen. I have a few leads for him to help him continue being a contributing citizen of Charlotte."